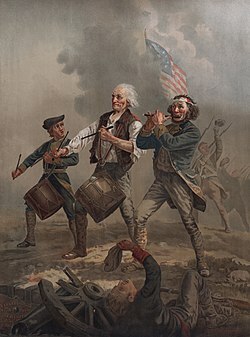 Patriots (also known as Revolutionaries, Continentals, Rebels, or American Whigs) were those colonists of the Thirteen Colonies who rejected British rule during the American Revolution and declared the United States of America as an independent nation in July 1776. Their decision was based on the political philosophy of republicanism as expressed by spokesmen such as Thomas Jefferson, John Adams, and Thomas Paine. They were opposed by the Loyalists who supported continued British rule. Patriots represented the spectrum of social, economic, and ethnic backgrounds. They included lawyers such as John Adams, students such as Alexander Hamilton, planters such as Thomas Jefferson and George Mason, merchants such as Alexander McDougall and John Hancock, and farmers such as Daniel Shays and Joseph Plumb Martin. They also included slaves and freemen such as Crispus Attucks, the first martyr of the American Revolution; James Armistead Lafayette, who served as a double agent for the Continental Army; and Jack Sisson, leader of the first successful black operation mission in American history under the command of Colonel William Barton, resulting in the capture of British General Richard Prescott. Prior to the Revolution, colonists who supported British authority called themselves Tories or royalists, identifying with the political philosophy of traditionalist conservatism dominant in Great Britain. During the Revolution, these persons became known primarily as Loyalists. Afterward, many emigrated north to the remaining British territories in Canada. There they called themselves the United Empire Loyalists. ^ "Patriot" in Oxford English Dictionary (3rd ed. online 2011). accessed 19 December 2011.